The weather has changed. In the morning, heavy dew beads the grass. Spider webs grow ever larger. I cling to summer, but she is slipping from my grasp, her face turned away as if no longer interested in me. The marine air moving in has cleared some of the forest fire smoke from the city. This photo was taken on Sunday, before the smoke thickened, stinging eyes and throats, and causing health officials to warn against outdoor exercise. Last night was particularly bad as the marine air pushed the smoke from further north down our way. Around bedtime it smelled as if the neighbourhood was on fire. I read a notice that fire officials asked people not to call unless flames were visible. This morning I can see faint bits of blue behind the haze, and I am thankful. I can breathe deeply without smoke catching in my throat. However, the situation has not changed with regards to the fires themselves. We desperately want rain. A few sprinkles are in the forecast for the weekend, but not the long dampening wet that is needed. Apples are falling from our two trees. 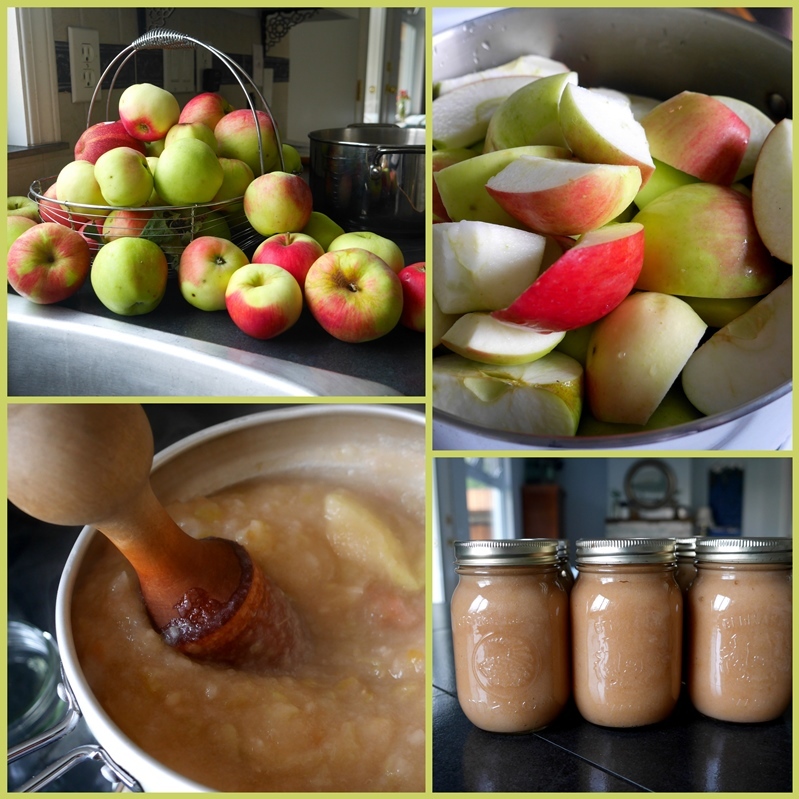 Yesterday I made applesauce and canned it for the winter. In my garden, tomatoes ripen red and round on the vines. Once bitten, a burst of sun-flavoured sweetness fills my mouth, better than candy. I roasted a tray of these little ones yesterday and could hardly stop from eating them all before dinner. The green beans are nearly finished, but I continue to pick one or two slender green zucchinis every couple of days. The butternut squash is growing fat and yellow. In a burst of energy yesterday, after processing the applesauce, I decided to make a double batch of salsa. I purchased roma tomatoes from the market and began chopping - first dipping the tomatoes into boiling water so that that the peel slipped off without effort. Onions, green peppers, jalapeño peppers, garlic, herbs and spices simmered long and slow. At 10 pm, with all the salsa in jars and lids on, I stopped and put the remaining jars in the fridge to process this morning. My grandmothers and their mothers before them preserved food for the winter. My mother still does, and she taught me. There is a deep sense of satisfaction in practicing this art. It connects me to my past, and to the seasons. Preserving food is something humans have done forever. When I prepare food myself, I know the source of the ingredients, and exactly what has gone into the product. In addition, is there anything prettier than rows of canned fruit, tomatoes, jams, pickles and more on shelves in the basement? I prefer to eat seasonally - fresh strawberries when local ones are available, otherwise frozen. A tomato tastes like cardboard in January and can't compare to one in August, so why bother? Our neighbour's thornless blackberry vine hangs heavy with fruit on our side of the fence. They must be picked at just the right moment, too soon and they are sour, too late and they turn to mush in my hand. Perhaps it's the back-to-school feeling, but once the end of August comes, I feel like autumn is knocking at the door. Still, September is a beautiful month of crisp mornings and sunny days mingled with rainy ones. Next week I begin work again, the students begin classes after the first weekend in September. In the meantime, I'll enjoy the summer that's left. Do you preserve food? Is summer drawing to a close where you live? Yes, Lorrie, preserving food is one of the most satisfying things about having a garden and growing your own produce. I think back to the hours spent by my Grandmother putting things into the pantry, no freezers then, but good old fashioned bottling (what you call canning). Plums, damsons, apples, so much goodness ready for Winter. Your tomatoes look so very appetising. I find it hard to get mine from greenhouse to kitchen...some get 'lost' on the way! We always make lots of different conserves, and bottle plenty of different fruits which we use to make crumbles etc during the winter months. I have been fighting the deer for my green beans, and I believe that they have been the winners by gobbling them up early in the mornings before we have arisen. I know how time consuming, yet rewarding, it is to preserve your beautiful fruits and vegetables. I have the very same wooden pestle and sieve with which I make applesauce. I also use it to squeeze the juice from my grapes to then freeze it. We'll hang on to summer like weather for awhile longer but I love it. And no, I don't can any more but one of my favs to can was salsa! Using all of those peppers and tomatoes at the end of the season. And I'm eating blueberries today from British Columbia....they sure are good! Hugs! Your zinnias are beautiful. Aren't they just the happiest little flowers, I love them :) We are longing for a rain or a good wind that will clear away all the forest fire smoke. We live at least 75 miles from any forests, but we still get the smoke. Not as bad as those living closer, but after a while it gets pretty old breathing that stuff. Here's to blue skies for both of us. We've been eating everything in our garden. I like the idea of preparing food for winter, but have never done much of that. If I make applesauce, I freeze it like my grandmother did. I still remember the thawing applesauce in little bowls at her breakfast table. It's hard to believe school is in session here. It comes so quickly, and seems strange when it's still so hot. I hope you have a great school year ahead! The heat and humidity shall return Saturday so we have just a hint of the change today and tomorrow. Absolutely low humidity today and last nights sleep was a deep and cool one! I prefer to eat seasonally too. The Corn is magnificent right now. I need to check for pears and apples tomorrow or Saturday . They are wild ones so I give them to the horses at the barn. The temps are lower, but the humidity is still way too high. One can’t do anything without dripping. I am hanging on to summer this year and praying that the final month of summer is beautiful. I am more likely to freeze food over canning. You had a long day of it! I was happy to can Lady Ashburnham’s that last autumn with my mother. She would be disappointed that I don’t continue. Such bounty...wonderful to see...my daughter was happy to find wild blackberries growing on her property. She loves them. We could finally take a deep breath today and even saw a patch of blue in the sky. Our daughter in law cans and freeze dries fruit and veggies. She has a vegetable garden. I'm in awe of all her skills. We used to preserve food before, but not so much now. I think it's a great tradition and a very useful one as well. Especially when winter rolls around. Thanks for your post and I wish you a great weekend ahead! Yes, we have had a hot summer and smoke here too. Normally I drag my feet about the end of summer and want it to last longer. Finally it cooled yesterday and I was able to do pickled beets, apple pies for the freezer, and a peach pie to eat now. I don't do as much as I once did, but there is just something so wonderful about stocking the larder with summer's bounty. Your bounty looks oh so good. What pretty apples, love the berry picture, zinnias are just glorious, and I do love seeing the finished jars of canned goodness sitting on the counter at the end of the labor. Beautiful! I am doing a fraction of the canning I've done in the past this year. I just put my focus elsewhere. We'll see what happens next summer. It is a satisfying and beautiful practice. Thank you for your kind words on my last post. I still am not getting my comments into my email so not sure that replying gets to the commenter. And the cherry tomatoes? You oven roasted them and then ate them like that? That sounds good and I've not heard of that before. I used to freeze some veggies, but my garden is smaller at this new home and we eat everything as it ripens. We have had a few cool nights but weather is suppose to warm back up in a few days. ahhh. I come from a long line of canning women. I mostly use my freezer to keep veggies and fruits fresh. I wonder if the new Instapot,, a modern version of the pressure cooker, will be good to use for canning? I love to preserve food for a taste of summer through the winter months. I preserved, pickled and packed a freezer for decades and your post makes me wish I still could. There was something so basically satisfying about it all, not to mention the good taste of everything on cold winter days. I remember even making jelly from the apple and peach peelings after I'd made preserves from the fruit. My husband used to joke that he was afraid I'd pickle him if he stood still in the kitchen too long during August. Oh, I pray that rains will come soon for all those in the wildfire areas! Your floral images are gorgeous! I'm impressed by your industrious food preservation. I live in a university town and one of the first signs of the end of the summer is the return of the university students. Frosh week now starts the last week of August. Oh I wish I could share some of the rain they've had in Madison (where our daughter lives) the past couple days! And today it rained all day here (3.5 hours north). I'm sure hoping you get the rain you need. Yes, I love canning. I didn't do any this year, however, because I still have about 50 quarts of tomatoes and many pints and quarts of green beans left over, and with the thought of moving next summer, I'm already trying to downsize (at which I'm not very successful). I think this August has been an unusual one for us, and not a particularly nice one. I'm looking forward to September and October, usually gorgeous months in Wisconsin, except that they usher in November (gray, bleak, cold, windy). And you know what follows that. LOL I hope you have a nice weekend and that more of that smoke moves out. We haven’t had a garden for a few years, but I miss homegrown veggies. We do have a wonderful produce stand close to us, and we enjoy what the grow! I for one am ready to let summer go. It’s been hot, humid, and rainy. Lorrie, your post is beautiful and sad all at the same time. Your kitchen must have smelled heavenly with applesauce and salsa canning. I don't really can as we don't have that big of a garden. I did freeze quite a few blackberries to enjoy later on in the year. 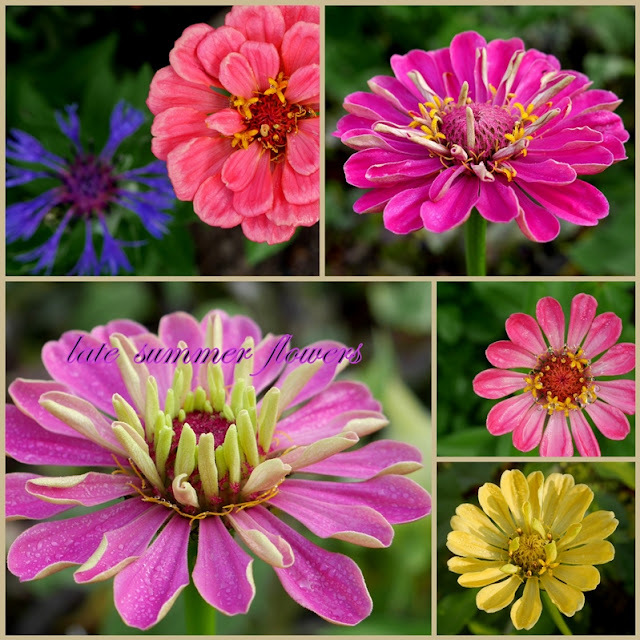 I love your zinnia mosaic! They are such cheerful flowers. As a girl, I never like the name 'zinnia' so I didn't care for the flower. When I finally realized just how lovely the flower was, somehow the name stained lovely too. Very glad about that. Yes, we long and pray for a drenching, soaking rain for everyone who needs it. We live many miles from any of the forest fires, but we're still saturated with deep smoke on many days. Your canning projects all look and sound amazing. They will be great treats in the deep of winter. Wishing you a wonderful week ahead. I'm still hoping and holding onto summer, although there was frost in not too distant regions last night. Will keep my fingers crossed. Beautiful flowers in your mosaic the colours are wonderful. So much fruit and produce from your bountiful garden this year, you have been busy preserving it all so that you can enjoy a taste of summer during the winter months. This week I made plum and preserved lemon chutney and plum compote with fruit from my neighbours garden, there is a deep sense of satisfaction to be had from undertaking such a timeless occupation. Hoping that the longed for rains arrive soon to help quench the forest fires and allow you all to breath more easily. Mosaic Monday is now open and I do hope that you'll be sharing this post with the MM crowd this week. I wish I could send it over to you. Once again you've written a lovely post, and I always enjoy seeing your photographs. I do hope the week ahead is a good one for you. We have preserving food in common, I love preserving food, your applesauce looks wonderful, I also enjoy making salsa this time of year. I will be praying of rain to clean the air and stop the fires. Beautiful ode to the bounty of late Summer. And even though we've been retired and away from following the school calendar for years, summer will always be over on the day school starts, no matter what the calendar says. I used to garden and can and freeze and dry and jam, but do not do so any longer because we travel during the winter. i wouldn't have missed the experience for anything though.... as you say, nothing makes you feel as good as having your own garden produce(or self-picked fruit) lined up in jars ready for the dreary days of winter. Those thornless blackberries look wonderful -- we always pick the wild ones that grow every single possible place in this area; they are delicious but definitely not without thorns. My arms are always scratched up this time of year. "Her face turned away as if no longer interested in me" - what a wonderful turn of phrase, my dear! Yes, summer is fading even though I am not ready. We turned the heating on in the house today just to take the chill off! In the woods, the flowers have all but disappeared - they have gone to seed and are hunkering down. Time does march on … my hubby and I have not done much food preservation, mostly owing to the lack of a vegetable garden or fruit trees. However, you may remember my post from last year when our neighbors gave us 5 pounds of plums and we made jam. Maybe we should buy some fresh vegies and fruit and do some canning … your photos are radiant with the earth's bounty - I especially like the light on the Concord grapes - stunning shot! I remember canning with my Mother and Granny ... tomatoes, pickles, all sorts of jams and jellies, beans. Sweet memories. I don't do any canning anymore -- bad hands. You've been busy ... apples, tomatoes and soon, blackberries. Be careful with all that bad air. The zinnias are beautiful. Loved this post! Have a great week. Such a tasty Monday with all your fruit and vegetables and sauces.